The editor of Norway’s leading newspaper, Aftenposten, Mr Stanghelle, has published an article about Norway’s Prime Minister, Erna Solberg’s coming visit to the White House. The angle of the article leaves the distinct impression that Stanghelle has a grudge towards President Donald Trump as Stanghelle’s article comes across as a deliberate smear campaign, at best as a poorly camouflaged attempt to hide the political crimes committed by Norwegian members of parliament in cooperation with Clinton, Bush and Obama. It is very disappointing to read that editor Stanghelle, editor of Norway’s leading newspaper, Aftenposten, presents his own personal opinions of Trump rather than reporting what the purpose of Erna Solberg’s future visit to the White House is. He does not focus on which journalism, instead does everything to discredit Donald Trump as a president. One would expect an editor of his calibre to stick to the truth, informing Norwegians of Erna Solberg’s upcoming meeting with President Trump and interviewing her abou the details of her upcoming visit, including what SHE expects or hopes to get out of the meeting. Nobody could care less about Stanghelle’s private opinions about Trump, his opinions are irrelevant, however his article reflects Aftenposten’s propaganda machinery which clearly has close ties to Norway’s “powers that be”, spewing out endless undocumented claims. Is Stanghelle abusing his position as editor of Aftenposten to discredit Trump without evidence in a typical cut-and-paste, spewed-up-and-paid-for article on behalf of Norway’s government which has something to hide? So, what is the reason Erna Solberg, Norway’s Prime Minister, has been called to the White House? Is it to adapt to new American politics under Trump? , including cleaning up the politically-created mess in Norway? Will she be “advised” to start cleaning up Norway from all the crimes and corruption committed by the current and previous governments against the people of Norway and the international community’s innocent victims of Norwegian warfare? Will she have to drain the swamp of Norway’s enormous corruption and crimes of the de facto Norwegian state after her meeting with Trump, to meet President Trump’s efforts to prosecute USA’s former presidents and their partners-in-crime for crimes against humanity - which is of paramount importance also in Norway. 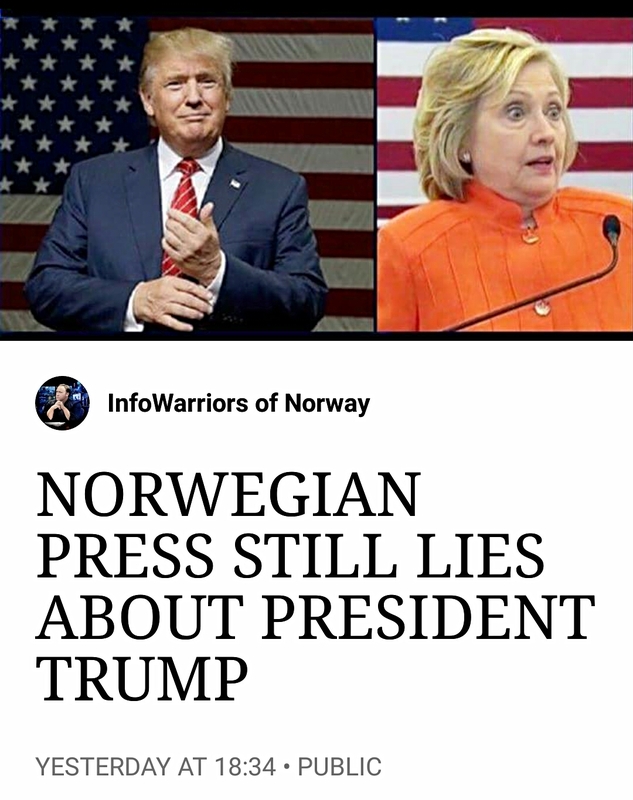 It’s disappointing to see that Stanghelle just continues on the well-known treadmill of mainstream fake news journalism instead of presenting the already well-known lies about President Trump that both Norwegian media and Norway’s politicians express publicly in Norway. His presentation of undocumented views, opinions and unpleasantries about Trump’s qualifications, politics and popular achievements in the United States has nothing to do with real journalism and comes across as a long list of statements in what looks like a bought-and-paid-for smear campaign to discredit President Donald Trump. What is it about Trump that the Norwegian press and policitians seemingly are so afraid of? Could it be that the attacks on Trump are a result of his administration systematically rounding up and endicting all the criminals associated with his predecessors in the White House, amongst them Bush, Clinton and Obama - who Norwegian governments have cooperated with in crimes against humanity? Is Stanghelle’s smear campaign a last desperate attempt by Aftenposten to discredit Trump ahead of Norwegian Prime Minister Solberg’s visit to the White House? Will this meeting include taking measures to reinstate Human Rights in Norway and return of the Law of the Land to secure the population’s rights and future? Could it be that Trump has documented evidence to tie crimes committed by Deep State USA to the Norwegian government, which are well-documented, and hopefully on the agenda? as this is necessary to put an end to political governmental suppression and robbery of the Norwegian population.